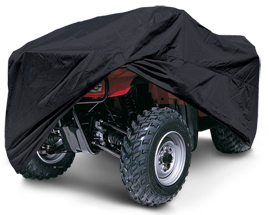 QuadGear ATV Storage Covers are manufactured to protect your vehicle from harsh climatic conditions. It is constructed with UV resistant ProtekX fabric that is extreme weather and abrasion resistant. This cover features elastic cord in bottom for quick and easy installation. It is backed by one year warranty.